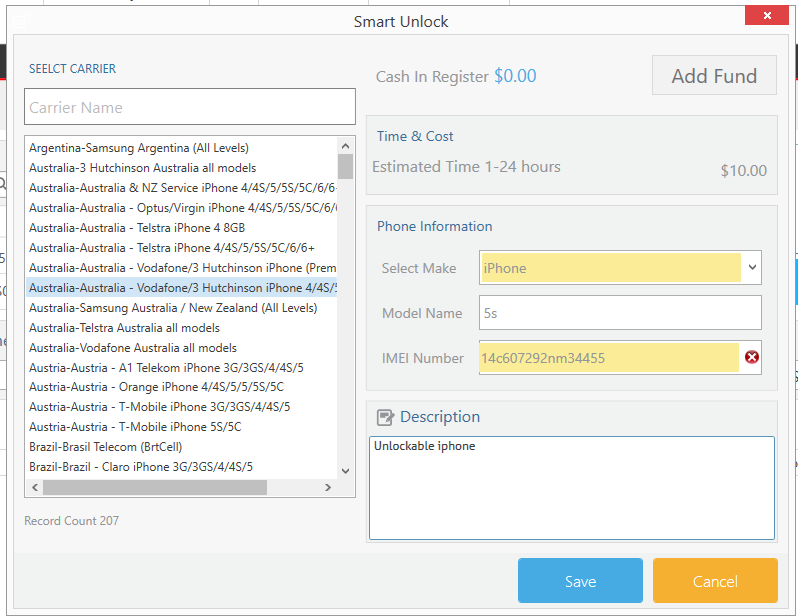 The unlock phone feature in CellSmart POS allows you to unlock any unlock-able phones by providing codes and instructions. You can select your device's carrier and make, and CellSmart POS will provide you with its unlock code and instructions based on the Estimated Time the software provides you with. Click on the New tab from the Icon menu. Then, click on the Unlock Phone icon. From the list of carriers, select the carrier that supports your device. Select your device's make( which device) by clicking on the Select Make drop-down menu. The Time and Cost of the unlock will be shown on top of the window. Enter the Model number of your device in the Model name field. ( Model numbers can usually be found inside the device's phone settings or in the back of the device). Enter the IMEI number of the phone in the IMEI field. Click save to Create an unlock invoice. After the Unlock is complete, it will fall under the list of unlocks. CellSmart POS allows you to add funds into your software's account. You may select this option and enter the amount of credit you want in your account and Click save. This option will allow you to unlock phones even when there is no credit card set up in the software or if the card is not working. After you have successfully created the unlock invoice through the new tab, you may go into the list of Unlocks through the List tab and the unlock invoice you created will be listed with its unlock code and instructions. you may follow those instructions and proceed with the unlock. You are charged when you successfully unlock a phone. If, for some reason, an error occurred with the code/instructions or for some reason the unlock did not work. You will not be charged, even when your card is setup in the software until the unlock is successful. You will be charged through the card you have setup in the software, or through the credit you have in your CellSmart account( Funds). you can view your unlocks through the List of unlocks, by clicking on the List tab and clicking on the Unlocks icon.